Pete Bridgewood has organised another 'Masters of Vision' exhibition at Southwell Minster and we went down to the preview night to see what's changed since the last exhibition. Well, the name is the same and although I'm not sure it's right for the exhibition, there is certainly some masterful work on show. I suppose we can split the show into a couple of sections, firstly there is Pete and colleagues who remain represented this year, Dav Thomas, Mark Gould, Chris Upton and Jonathan Horrocks (Chris Upton has a gallery with Pete at the Patchings Art Centre), then there are the celebrities - David Noton, who is the master 'Master' and also two magazine editors, Steve Watkins (who is editor of Outdoor Photography magazine and a travel photographer) and Damien Demolder (who is editor of Amateur Photographer and a self confessed photographic generalist). The photography was on the whole very good quality but I must mention particularly notable work overall by Dav Thomas and Chris Friel whose work you should be familiar with through our articles on them. Chris Friel's are more impressive in print form than on screen and are well worth seeing. Dav's pictures I know very well but seeing them in print is a pleasure. The two pictures that was really transformed through printing are his Rannoch Moor pond (which I scanned for him - do I get brownie points?) and his 'Constable' where the tones of the negative film really shine . David Noton's qualifications as a professional landscape photographer are without question and the eight panels of photography shown here provide a great slice of his work from earlier 6x17 work to more recent digital panoramas. I was particularly drawn to his vertical 6x17 rain forest photograph and his sunrise at Te Pare Point. I was pleased to see that over 2/3 of his pictures were his classic 6x17 film shots which were printed and displayed beautifully - Out of the film work, I really loved the rainforest, trotternish and cloudburst shots and out of his digital work, the stand out shots were his Te Pare point and the poppies shots (and some of the other Tuscany photographs too). Steve Watkins and Damien Demolder are clever choices by Pete - whilst not who I would choose for my 'masters', they do have some great pictures (especially Steve Watkins Bamboo photograph which I was repeatedly drawn too) and they certainly add to the promotional aspect and reputation of the exhibition. Chris Upton's work is greatly improved over the previous exhibition and I particularly liked his Santorini and New York bridge shots (at least I think it's New York). Mark and Jonathan have also raised there game, Mark produced a set of photographs from Scotland (via one shot from Porth Nanven), including a wonderful symmetric shot down toward Rannoch Moor. Jonathan also has his Porth Nanven shot plus a range of coastal work from rock pools to sea views (great pebbles). His best work was the black and white panel which showed an original, aesthetic view and the two beach photographs showing flowing water - very nice. Pete's work shouldn't be underestimated either - a lot of it definitely from the dreamscape end of photography with mist and long exposures abstracting the landscape supported by a couple of very nice looking piers. It was Pete's two Castlerigg photographs that I liked the most though - wonderful, particularly the black and white. 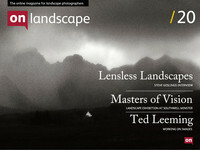 In all, this is one of the better landscape photography exhibitions I've been too - a stunning location and some great work. I recorded a little bit of video and a snippet of a chat with David Noton. Try to get up to take a look sometime until the end of August.